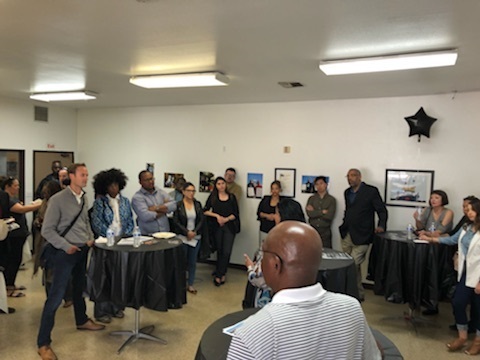 Last Friday, it introduced the new World-Famous VIP Business Incubator and Multi Media Center to city staff and community leaders. The center aims to help start up small businesses and become a social enterprise to lift communities out of poverty by providing them space, education and resources through entrepreneurship. The center is slated to open in June and will focus on nurturing those who want to start a business by providing a team and the necessary equipment needed to accelerate the process, according to VIP Record President Shirin Senegal. Photographer Tromaine Ellis and VIP Records co-founder Kelvin Anderson during the opening of a photo exhibit showcasing Ellis’ work. Photos courtesy of Shirin Senegal. 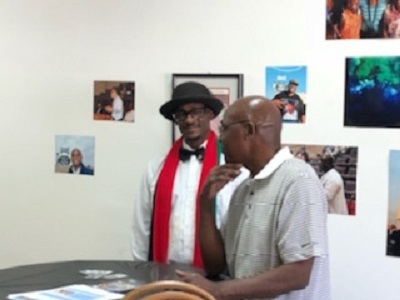 The day also featured a fundraiser for a photo exhibit displaying photographs taken by local photographer Tromaine Ellis—who documented the removal of the VIP Records sign in January— and plaques that were given to VIP Records over the years. The photo exhibit was attended by Vice Mayor Rex Richardson and Councilmembers Lena Gonzalez and Jeannine Pearce among others. A second showing of the photo exhibit will take place Saturday, May 5 from noon to 6:00PM. Those who attend the photo exhibit can pick up brochures on how to become an incubated business, said Senegal. Ellis’ photography work is the center’s first startup business, according to Senegal. He is in the process of being confirmed as one of the first community-funded financial borrowers in Long Beach as part of an economic initiative to help underserved communities spearheaded by Richardson last November. With this Kiva program loan Ellis will be able to purchase all of the equipment needed to continue to grow his photography business, Senegal said. The second business VIP Records will help is Long Beach Local News to provide more reporters, sponsorships and more. Senegal hopes to bring in city council members and entrepreneurs to build the future of the incubation center. Those who want to start a business in technology, creative arts, food trucks or home based businesses with the center can fill out an application here, Senegal said. “During the application process we identify the needs of the entrepreneurs so we can provide them with the support and partnerships to help them achieve success and help build their credit and financial picture,” said Senegal. Potential entrepreneurs will be given the the support to start and sustain a business long term, and will also be provided with a space to work in the center, access to the computer lab, a radio station, video equipment and a conference room, said Senegal. To learn more about the incubation center and how to join, click here. The center is located at 2242 Long Beach Boulevard.